This month I thought it would be fun to give you some easy ideas for after school snacks, from around the world! This would be a fun way to welcome your kids home, and you can even keep the learning going with some interesting facts about the country the food is from, showing them a picture of the country and where it is on the globe, or making these after-school snacks the precursor to a full-fledged international meal! When making and serving these snacks, feel free to try them yourself! What better time to talk about your children's day at school than over a fun after school snack? 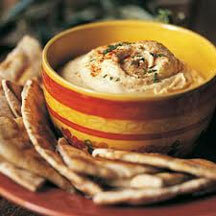  Hummus with Pita Chips: This is a great snack because it is also healthy! See full hummus recipe below, or you can use store-bought hummus. Pita chips are great dippers, and if you want to make your own, get a couple of whole wheat pitas, split open, and cut into fourths. Bake in a preheated oven at 350 degrees for about 8 minutes or until crisp, remove from oven and sprinkle with parmesan cheese. Return to oven for a few seconds until cheese melts. Hummus is a Middle Eastern food, popular in countries like Turkey and Morocco, countries that your children may not be overly familiar with so it can turn into a fun learning opportunity! Combine chickpeas, lemon juice, tahini, olive oil, cumin and salt in a food processor bowl. Process until a smooth paste forms. Spread chickpea mixture into a serving bowl; stir in spinach. Serve with pita chips.  Caribbean Quesadillas: I know, quesadillas bring to mind visions of salsa and guacamole, not the Caribbean islands, but this tropical version (recipe below) will change your mind! 1. In a small bowl, stir together the honey mustard and pineapple preserves. Divide the mixture evenly between 4 of the tortillas. Spread evenly to within 1 inch of the edges. Distribute the Swiss cheese, chicken, bacon evenly over the pineapple mixture; top with remaining tortillas to make quesadillas. 3. Heat a large skillet over medium heat. Melt a small amount of the butter in the skillet, tilting the pan to cover the surface with butter. Place one of the quesadillas into the skillet, and fry on each side until lightly browned and the cheese has melted, about 1 1/2 minutes per side. Keep cooked quesadillas in a warm oven while you fry the remaining. 4. To serve, cut each quesadilla into 6 wedges and arrange on a platter with pineapple tidbits in the center.  Oven Baked Bean and Cheese Nachos: This snack is to represent Mexico and the Latin American nations, countries that are rich in culture and history, and very fun to learn about! Preheat your oven to 350 degrees, then spread tortilla chips on a baking sheet. Top with refried beans (or black beans work as well) and sprinkle with sharp cheddar cheese. Bake for roughly 5 minutes, until the cheese is melted and the beans are heated through. Top with salsa and guacamole, you can even top with sliced olives and diced onions for a very "loaded" nacho experience!  Bruschetta: This is another great recipe since it is healthy and delicious! (Recipe below) Bruschetta is a traditional Italian snack or appetizer, and it actually only refers to the bread once it has been treated with garlic and olive oil! The tomato topping that we associate with bruschetta is just that, a topping. I have included a recipe below for a great tomato bruschetta topping, and who doesn't love Italian food? 1. Mix together all ingredients except icing sugar & jam. 2. Fry tablespoons of the mixture in butter until lightly browned on one side then flip and cook other side. 4. Sprinkle with icing sugar & serve with jam.  Filipino Sponge Cake (Mamon): These are muffin-sized little cakes that are great for snacking because they are very sweet and soft. (Recipe below) My husband lived in the Philippines for two years as a young adult and his stories make me want to visit there so much! The Philippines have an interesting culture, and their food is oh-so-yummy! 2. Sift flour and baking powder in bowl; set aside. 3. In a another large bowl, beat egg white and cream of tartar until meringue-like but not stiff. 4. Gradually add sugar while beating. Then, add vanilla and vegetable oil. 7. Line muffin pans with paper cups and pour mixture about 2/3 full. 8. Bake 12 to 15 minutes or until golden brown. Finished when toothpick comes out clean.